The U.S. Air Force is overhauling its procedures in the wake of the Sutherland Springs shooting. 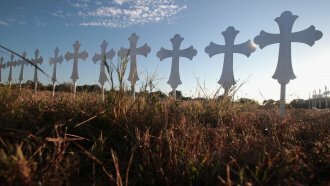 The man who shot and killed 26 people at a Texas church was a former airman discharged for bad conduct over a domestic violence conviction in 2012. That incident should have kept him from purchasing a gun — but the Air Force didn't properly report it to civilian law enforcement. A preliminary review found similar reporting lapses across the Air Force. To fix things, the Air Force is double-checking all reportable offense records going back to 2002 and putting new procedures in place to make sure the proper requirements are being met. The Air Force is already facing several lawsuits from the families of Sutherland Springs victims, one of which blames "institutional failures of the United States Department of Defense" for allowing the shooter to access firearms.